August 6 - Transfiguration of the Lord - Feast - My Catholic Life! It was not a miracle that Jesus Christ transfigured Himself on Mount Tabor before the Apostles. It was a miracle that He maintained His common, earthly appearance for the whole of His life. It was a miracle that His face was not glowing like the sun as He walked the hills and valleys of the Holy Land. Christ’s normality, His sustained suppression of His divine radiance, was a miracle of humility, of slavish devotion to His vocation to incarnate, teach, suffer, and die for mankind. The Christian believes in the resurrection of the body and life everlasting in that body. We believe this because of the appearances of the risen Christ after His resurrection, because of His bodily Ascension into heaven, because the gospels specifically mention the empty tomb, and because of the events of today’s feast. 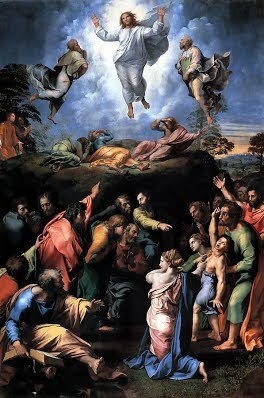 The Transfiguration shows the splendor of truth. It is a peek into the life of heaven, where we see that Christ will not shed His human skin. Christ will bring His humanity to heaven and glorify it. This exaltation of flesh and blood is one reason why the Church has such immense respect for the human body. The Church’s understanding is contrasted by two extreme views on its flanks: one overly spiritualizing man, and the other overly materializing him. The religions of the Orient stress the inner life of man to such an extent that they see him as a pure spirit caged in the body, glad to escape the confining carcass at death. From this Oriental perspective, the body is a trap for the soul. On the other flank is the Western materialist view. It sees the body as having priority over the soul to such an extent that physical, sensory experience is the best, and only, path to knowledge. This Western lens sees the body as a sensory sponge meant to soak up as many external experiences—pleasure, music, travel, conversation, food—as possible. If you don’t experience something yourself, you can’t assess its truth or value. This personalizing of existence reduces all reality to “me” and leads to cultural breakdown. But neither an excessively spiritual nor an excessively material understanding do the body justice. A balanced understanding of the relationship between the body and soul is a hallmark of traditional Christianity. When Christ reveals His glory, He doesn’t point a long, bony finger to a colorful rainbow on the horizon. He doesn’t puff His cheeks and blow a strong rush of wind on the Apostles’ faces. And He doesn’t sit down and start playing soothing melodies on a harp. Christ shows the Apostles the truth by showing them Himself. He shows them His arms and legs and torso and face and hair. It’s a real body. Jesus gives us a target to aim for. He shows us that the destination is Himself. We desire heaven because Jesus is there. If He were not there, then heaven would not be heaven. He, not a place, is the true destination. A mystery is not something we can know nothing about, but something we can’t know everything about. A comprehensible God would not be God, but an entirely opaque God would also be too remote for us to care. Catholicism’s theology of the body has a beautiful equilibrium because our God is knowable and yet mysterious. Food, drink, dancing, smoking, romance, music, and beauty are not sins. The body is good, and God took one Himself as proof of that. But while nature is the source of human operations, a person operates them. So the person prevails over the tools he uses. The body, then, must ultimately be a servant. We are enfleshed souls. In heaven, hopefully, we will be most truly us, and have our ideal body. Every man and woman will be transfigured like Christ and radiate the glory of the Trinity in heaven, like a white sheet radiating the sun that shines behind it. Lord of the Transfiguration, Your glorified body gives us hope of the glories to come in heaven, where You will be the destination. May Your glorified body inspire all Christians to live well their body-soul uniqueness on earth until they are perfected in heaven through You. sons of Zebedee, Sts. James and John, and led them to a retired mountain. Tradition assures us that this was Mount Thabor, which is exceedingly high and beautiful, and was anciently covered with green trees and shrubs, and was very fruitful. It rises something like a sugar-loaf, in a vast plain in the middle of Galilee. This was the place in which the Man-God appeared in His glory. Whilst Jesus prayed, He suffered that glory which was always due to His sacred humility, and of which, for our sake, He deprived it, to diffuse a ray over His whole body. His face was altered and shone as the sun, and His garments became white as snow. Moses and Elias were seen by the three apostles in His company on this occasion, and were heard discoursing with Him of the death which He was to suffer in Jerusalem. The three apostles were wonderfully delighted with this glorious vision, and St. Peter cried out to Christ, “Lord, it is good for us to be here. Let us make three tents: one for Thee, one for Moses, and one for Elias” Whilst St. Peter was speaking, there came, on a sudden, a bright shining cloud from heaven, an emblem of the presence of God’s majesty, and from out of this cloud was heard a voice which said, “This is My beloved Son, in Whom I am well pleased; hear ye Him” The apostles that were present, upon hearing this voice, were seized with a sudden fear, and fell upon the ground; but Jesus, going to them, touched them, and bade them to rise. They immediately did so, and saw no one but Jesus standing in his ordinary state. This vision happened in the night. As they went down the mountain early the next morning, Jesus bade them not to tell any one what they had seen till He should be risen from the dead. Reflection.—From the contemplation of this glorious mystery we ought to conceive a true idea of future happiness; if this once possess our souls, we will think nothing of any difficulties or labors we can meet with here, but regard with great indifference all the goods and evils of this life, provided we can but secure our portion in the kingdom of God’s glory.